Mowing the lawn is not only Kujo's original inspiration, but also a weekly pastime that millions of homeowners disguise as "work". This relaxing "chore" is a ritualistic excuse to soak up that fresh cut smell and admire those crisp manicured lines. We love our yards, but some mowing habits may be hurting them. If you want lush and healthy grass, follow these tips to mow like a champion today! The mower should shear off only 1/3 of the blade of grass at a time. This is the optimal amount of blade for nourishing roots and creating a denser and healthier carpet of grass. By cutting the grass too short, the mower is effectively destroying the blades of grass and forcing the remaining root system to focus on pushing up new blades rather than sinking deeper roots. While that hurts the grass we love, the extra sunlight and resources (such as water and space to grow) can lead to weeds or unwanted types of grass overtaking the lawn. Also remember the importance of a sharp blade. It slices rather than tears the grass, and this results in much healthier and richer grass. If your mower has a collection bag, remove it and let the clippings mingle into the grass. If you stick to a good mowing schedule, the clippings actually feed the grass by breaking down into the soil. Too long of clippings can put excessive weight on the blades and do some damage. You might already know to avoid cutting the grass when there has not been adequate rain or when the soil is dry. This kicks up dust and does a lot of damage to the grass itself. However, it is just as harmful to mow the lawn while still wet or even damp from dew. Wet grass can lead to an uneven cut and the clippings can clog the mower. Thick clumps can actually smother areas of the yard as they fall away from the blades. Also make a point of mowing only when needed and not out of habit. "But I always mow on Tuesdays." 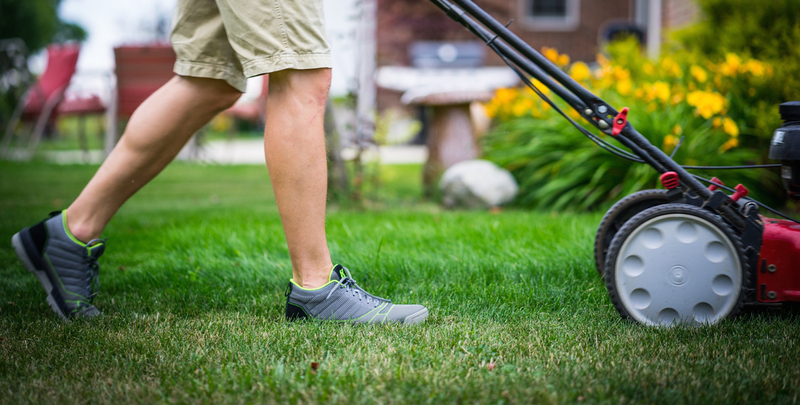 Though sticking to a routine in the yard and garden is an ideal way to keep maintenance under control, when it comes to mowing, you only need to mow when the grass is the right height, dry, and "old enough". A newly seeded lawn should never be mowed until all seedlings have emerged and reached an actual mowing height. Because newly seeded areas have shallow roots, mowing them too soon or too short quickly kills the plants, or inhibits growth. Finally, keep track of the "direction" you last mowed. If you went across the width of the yard for the previous mow, go along the length of it this time, or even do the ever-pleasing diagonal mow. Mowing is something that, if done improperly, can really undo a lot of hard work. Make your work count, soak up the sun, and enjoy lawn-mower-therapy, Champ!